How A Stump Grinding Service Can Help You | Mr. Tree, Inc. When you have a tree removed, there is very often a remaining stump that must be dealt with to complete the job. Sometimes, a stump is left behind for other reasons as well, including extreme weather conditions that knock a tree over, or even age-related problems that lead to a tree falling for other reasons. If you have an unsightly stump sitting on your property, it may be time to hire a professional service that specializes in stump grinding in Portland. A good stump grinding service can remove the stump you have on your property and set up the landscape with other projects that will turn it into something beautiful. 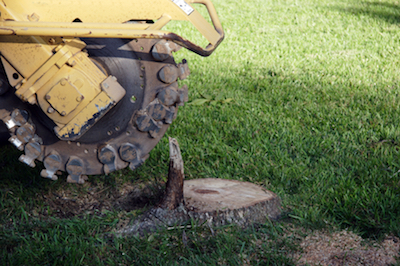 There are many more reasons why you should always hire a stump grinding service to help you with stump removal. Chances are that you do not have any stump grinding equipment lying around your property, which is why you should hire a professional who already has all of the necessary equipment to do the job. Renting the necessary equipment can get very expensive, especially if the project takes longer than a weekend or even a day. A professional tree service company that offers stump grinding will not need to charge you extra for equipment, as they already have the equipment at the ready. Not only do they have the equipment, but they know how to operate it expertly, while you may not be at the same skill level. Save yourself a lot of time and effort by hiring a professional to perform the task for you. Once you have removed the stump, you will want to do something with the open space. If you do not have any landscaping experience, or simply have no ideas after the job is done, a professional stump grinding service can help you find a solution to the problem. If you are stuck with a large open space once the stump is gone, a professional service will be able to make suggestions and take care of the work for you once a solution has been decided upon. You have many different options when it comes to projects after the stump has been removed. You can put other vegetation in the spot, including a new tree that can complement your landscape, or you can add a stone project like a fountain. There are many other options available that you can discuss with your tree service after the stump has been removed.